On being presented with just two or three features on the outside of The Foundling Museum – a 1930s building, taken from the original Foundling Hospital established by Sir Thomas Coram near Lambs Conduit Street in 1745 I was, I must confess, a little under-whelmed. As a writer I have long been drawn to this place – or, rather, the idea of it: the touchstone this museum provides to all the women and children whose lives it touched. And I felt this long before I, too, became a mother. The obvious call is the wretchedness of those women forced by pitiless circumstance to part with their babies. The compassion of those who put themselves out to help them, too, at a time when many more simply looked away. And the tectonic plate-shift wrought by the separation of any mother and child, whatever the circumstance. Far better to have been given a tangible and clearly-defined artefact from the inside of the building, then. Or so I thought. Until, staring up at the museum’s red brick exterior as daylight turned one chill February afternoon, I found myself thinking … not of my son and how awful it would be to have to choose to part from him, but of my own mother fast-fading into grim the darkness of Alzheimers. Rather than the mother’s loss, I was more attuned that day to that of the child. And the more I thought about this, the more I thought about the idea of addressing the loss of a mother – not from the perspective of a tiny baby or the child they would become but an adult, along with the inevitable re- consideration of our own immortality that comes with the loss of a parent. A rich vein, and one that is (still) tempting to explore … and yet too intricate, I decided, for the unique confines of a sestude – just 62 words. Because while this was to be my response to the artefacts I was assigned, this wasn’t – and, I knew, shouldn’t be – about me. The aim of 26 Pairs of Eyes is it to provide a fresh perspective on the items within, around (and yes, on) the Foundling Museum. And to do anything other than focus on their origin and relevance and meaning felt like it would be a kind of betrayal of the women and children whose lives Sir Thomas Coram touched. In search of inspiration I stood and stared, my eyes ranging back and forth across the museum’s austere façade until, time and again, they settled back on just one thing: the lead drainpipe with its lamb motif. This, along with the two posts (in the shape of obelisks) with were either on the original hospital building or in a 1756 engraving of it, I’d been reliably informed. 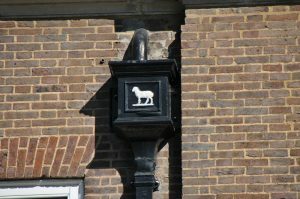 Was the lamb on the drainpipe a reference to lamb as metaphor for Jesus, “the Lamb of God”? Or a nod to nearby Lambs Conduit Street. A street named, in turn, after William Lambe for the £1,500 he gave for the rebuilding of Holborn Conduit – an Elizabethan dam made in one of the tributaries of the river Fleet in 1564 and restored in 1577 by William Lamb? I have always loved the childlike simplicity of this poem. So I played around with the rhythm, imagining a mother bringing her child to the hospital’s front door, preparing herself to say farewell for the very last time. Being apart – or, in my mother’s case, unable to recognise or remember parts of her life, her family – cannot weaken true love, I thought. And as I considered this I remembered the pair of compasses in a John Donne poem. Poetry was another inspiration, then, and this – my sestude, Valediction – the end result. Now, as I re-read it again, it strikes me it can be just as easily read one way or the other: from the perspective of a mother to her child, or from a child to her mother. Or perhaps that’s just me. will be the better one. replace or e’er regret thee.